Toronto, March 29: For 1400 years the domed structure of the Hagia Sophia has stood strong bearing witness to the whims of men – the conqueror and the conquered. And now it is in the limelight again as Turkey’s President Recep Tayyip Erdogan, as part of a poll promise says he will restore the building to its earlier function, of serving as a mosque. This after Turkey's top court in September 2018 had ruled against a request that the Hagia Sofia museum be opened for Muslim worshipping. The Constitutional Court rejected a Muslim association's demand, on "non-competence" grounds, indicating it was not the proper instance to allow any change to the status of the building, the official Anadolu news agency had reported. Erdogan speaking during an interview, said it had been a “very big mistake” to convert it into a museum. “Hagia Sophia will not be called a museum. It will be taken out of that status. We will call Hagia Sophia a mosque,” Erdogan told the interviewer of A Haber television. “Those who come to Hagia Sophia will visit Hagia Sophia mosque,” he said. The Hagia Sophia museum has fueled tensions in the region for long as it was built as a cathedral in the sixth century under the rule of the Byzantine Empire but was converted to a mosque in the 15th century after the Ottoman Empire took over. Islamic minarets were built around its Byzantine dome by the Muslim conquerors. After the collapse of the Ottoman Empire, Turkey’s founding father Mustafa Kemal Ataturk ordered it to become a museum, which would be open for all. Turkey which was founded as a secular country despite its Islamic heritage, has increasingly moved towards the right under Erdogan’s rule. There has been an increase in Islamic activities inside the museum in the past years, with Koran readings taking place on occasion. These have been followed by strong objections from Christian groups as well as Greece, as the cathedral was a former Greek Orthodox Christian patriarchal cathedral. It should be noted that President Erdogan is campaigning for local elections in the country and has used increasingly right-wing rhetoric to shore up his Muslim base. He has used videos of the recent Christchurch mosque attack to vilify his opponents, despite protests from New Zealand and Australia. 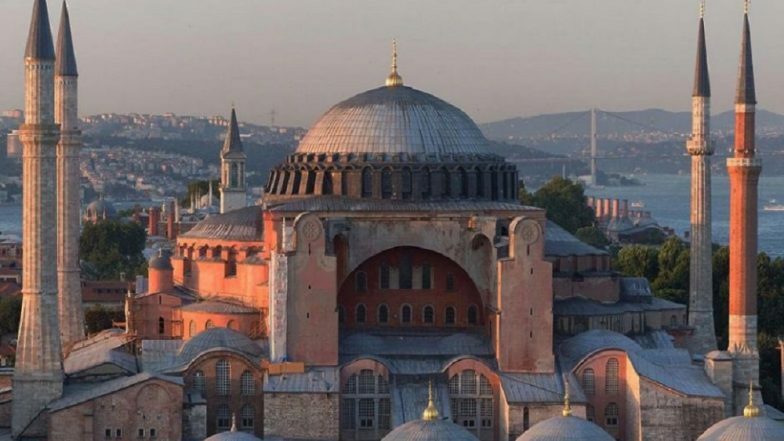 The Christchurch attack is also linked to the Hagia Sophia museum as the White Supremacist terrorist Brenton Tarrant had cited the conversion of the Hagia Sophia into a mosque, in his 74-page manifesto, as evidence of the injustice carried out by the Muslim community against Christians.